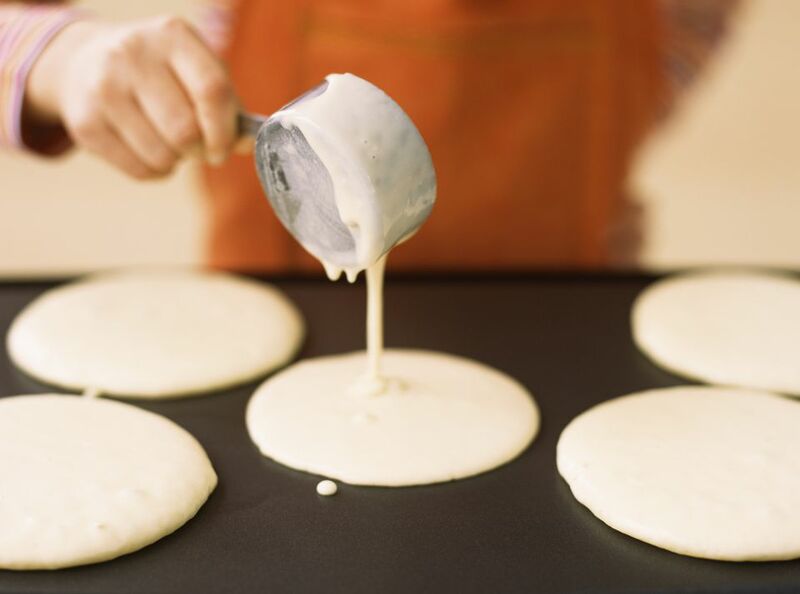 Pancakes are made by cooking a simple batter of flour, milk, and eggs on a hot griddle or skillet. In addition to these three ingredients, baking powder is also essential. It's what causes the pancakes to rise, so they turn out fluffy and light. Make sure to use baking powder, not baking soda. The two aren't the same thing. The batter also needs a small amount of salt and sugar, and we like to add a dash of pure vanilla extract as well. A griddle is a good thing to have when you're making pancakes (as well as French toast) because a griddle is flat and has no sides, which makes it easy to slide your spatula underneath the pancakes to flip them. Electric griddles are helpful because you can set the temperature and it will stay there, which is important. So if you're new to making pancakes, we recommend using an electric griddle. For beginners, that's one less variable you have to worry about. You can also use a cast iron, stainless steel or aluminum griddle, or if you're a millionaire, a copper one. If you don't have any kind of griddle, an ordinary skillet will do. Depending on how high the sides are, it'll be slightly more difficult to flip the pancakes. But if that's all you've got, it'll work. Use the widest skillet you have, so there's room for more pancakes. Make sure your baking powder is fresh. If it's older than six months, your pancakes won't be as fluffy. Also, you might want to check out this article about measuring flour. Crack the egg into a small bowl and beat it with a fork until it's frothy and a uniform pale yellow. In a large bowl, combine the flour, baking powder, sugar, and salt. Stir to blend. You can use a fork, a spoon, a wooden spoon, or even one of those rubber spatulas. Now add the milk and the beaten egg. Stir until the wet ingredients are mostly combined, about ten seconds or so. If you stir too long, your pancakes will be tough and rubbery. When you're ready to begin, take the batter out of the fridge. It should be thick but pourable, not gloppy. Stir in some milk if it's too thick. Heat your griddle to 375 F. Your electric griddle probably has some sort of light that comes on when it reaches the desired temperature. For stovetop griddles or skillets, heat it over medium heat until a droplet of water dances around. If it just sits there, it's too cool. If it instantly sizzles and evaporates, it's too hot. Pour a small drop of cooking oil onto the surface of your griddle—about the size of a quarter is about right. Wipe the oil around the surface with a paper towel so that the surface is lightly coated. Pour ¼ cup of batter near the edge of the skillet. Keep pouring pancakes until there's no more room. Hopefully, you can fit 5 or 6 pancakes on the griddle, but don't cram them in. And if two pancakes blend into each other, that's all right. You can separate them with your spatula right before you flip them. In a minute or so you'll notice little bubbles forming on the tops of the pancakes. When the bubbles have mostly popped and the edges of the pancakes look dry (which may take about 4 minutes) flip them with a spatula. Cook for another 1½ to 2 minutes, then remove the pancakes from the griddle to a plate. You can keep them warm in the oven, or let people start eating while you cook the rest. Repeat the steps above until you've used up all the batter. If you're using a stovetop griddle, you might want to lower the heat slightly for the second batch so they don't burn. Serve the pancakes hot, and don't forget the maple syrup! Also, check out this easy pancakes recipe.